I get wind of a new Case Studyo Artist Series drop. I immediately call founder Mathieu Van Damme. He picks up (thank god, it would be extra awkward otherwise) and we start talking about what is being released. Then he starts dishing about all the other new stunning projects he's got coming up and I completely forget all the things I wanted to ask in the first place because the extending list of people wanting to collaborate with him and his CS-friends is always so great. What I'm trying to say is : Case Studyo = Producer of FLAWLESS ART. Today they revealed two brand new PARRA "DOWN" sculptures hot off the launch of the gorgeous ED TEMPLETON "LAMP". 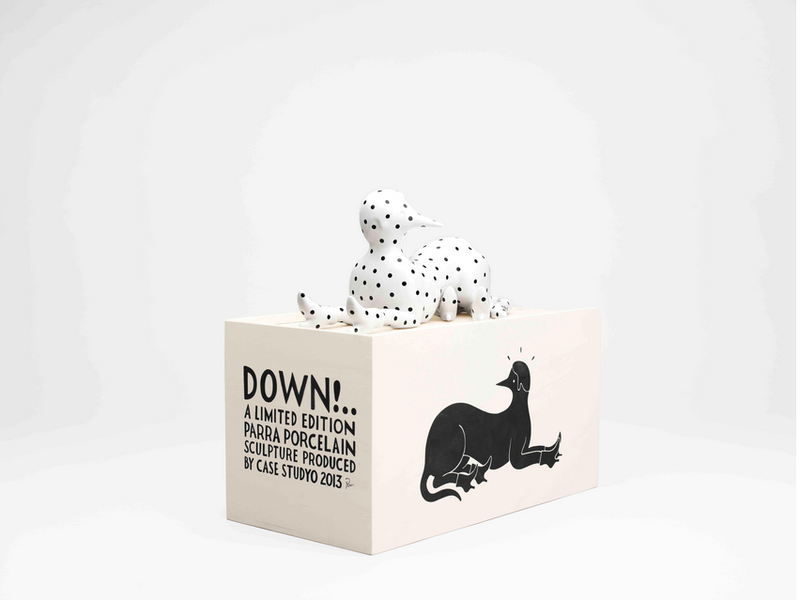 The follow up of the previous “Lay Down…Lay it all down” edition with 2 new figures in black and white called “DOWN!” Both editions refer to the title from the iconic song 'Lay Down' by Melanie. This porcelain edition 25 black & 25 white, comes in a wooden screen-printed box with signed & numbered certificate by the artist. For his first collaboration with Case Studyo a ‘LAMP’ was created based on Ed Templeton’s signature head-figure objects. This resulted in a beautiful object during the day and an atmospheric light-object for at night. Each side represents a female figure, 52cm (20.5inch) high. It comes in a wooden and silkscreened box with a signed and numbered certificate by the artist. Here's evidence of the first time I couldn't stop asking Case Studyo Mathieu's all kinds of questions. Want to read an in-depth Ed Templeton interview? I got you.